Website launch. Update notifications on this blog. This website is a centre piece of my life. My life is chanoyu, the Way of Tea, and this website shares many videos, essays, translations and images relating to this path. It's a place of sharing and communicating. No borders. Throughout all my chanoyu activities, there is one, firm aim: peace to the inner and outer world through tea. Meditating is great for the inner world, but the uniqueness of chanoyu is that it works both on cultivating inner peace and spreading it outwards at the same time. The peace we cultivate within ourselves through the practice of tea is also meant to be directed outwards to others and the natural world. Another of the intended meanings behind the catch-all phrase above is the active creation of peaceful community. 'Chanoyu World Town' as I like to call it, borrowing a bit from M.I.A. Chanoyu creates a space for people to come together and celebrate being alive. 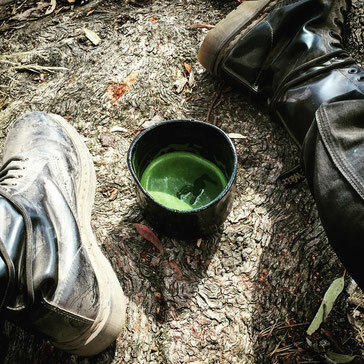 We feel out the deeper source of our self in the tea space. The person next to us does the same. It's a good bet that all people in the space will sooner or later arrive at a point as similar as it is ineffable. As we dip down into this common ground, we learn humility, respect, reverence, develop our taste for beauty, strengthen our compassion, and experience a uniting, absolute tranquility that heals, inspires, loves and embraces all. To create a successful tea space that allows for that just described to take place, there first needs to be a lot of work done by the person conducting the tea gathering. This website is for these tea practitioners, those actively working for peace within themselves, for their immediate community, their natural surrounds, and the World Town. As I am a teacher of the Ueda Sōko School, 'Ueda Sōko' references stud this site. The 'Ueda Sōko Tradition of Warrior Class Chanoyu' is a small school from Hiroshima to which I owe my training. It has continued Furuta Oribe and Ueda Sōko's style of tea for 16 generations, unbroken. There is obviously some very important flame to keep burning. This site is a candle of that same flame. But as fire does not discriminate, I'm no 'tea patriot'. Whether Ueda Sōko Ryū, Omotesenke, Sōhen Ryū, Enshū Ryū, Urasenke, Dainihon, whichever of the myriad schools, I see no borders around the spirit of chanoyu. I fly the flag for authentic expressions of that spirit. What I do see a border around is one's practice. You need to structure the development of your tea spirit in order to cultivate depth of feeling and a mastery that integrates your utensils, body, breath, mind and guests. This comes through learning ancient forms of conduct and set tea rituals. As Joseph Campbell noted: "If you learn form, you can achieve a great deal of freedom within the form. But if you try to go for the freedom without the form, all you have is anarchy." So please enjoy the information on this site. It's all under Creative Commons, Attribution-NonCommercial. I hope the stuff shared on here can take flight in a new way over the net and materialise in the world, furthering the purpose of chanoyu mentioned above. I will be updating this site regularly - adding new articles, videos, translations, poetic names for chashaku, zen phrases, essays and practical information about the art of chanoyu. As I add new bibs and bobs, I'll blog about what's new. Please look to this blog to see what's happened since you last visited. 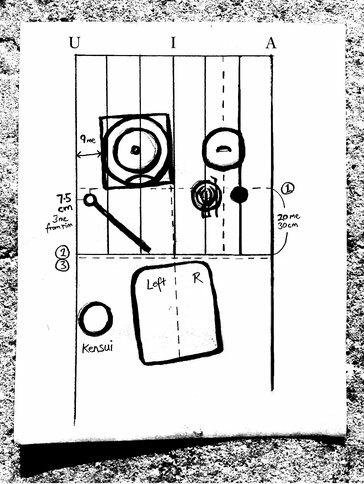 One of the new pieces of information I've released on this website publicly for the first time, is a set of diagrams on the page kanewari - orientation and placement in Ueda Ryū. One of the diagrams is to the right. Oh, and if you want to actively learn, bonus! I'm here, with lots to share. My students are littered throughout the globe - in France, Australia, U.S.A, Czech Republic, England, Germany and Norway. You can learn wherever you are and we get together for intensive practice in Europe and Australia, hopefully the U.S. soon, too. Here's to keeping the flame alive, burning bright, and boiling our billies for chanoyu to share across the World Town.